The projected map was a subliminal reminder of the stakes of the speech Vladimir Putin delivered to the Federal Assembly. –and allowed him to present a “State of the Nation” that projected the future global dominance he foresaw of Russia within the world, and allowed him to present an argument of protecting the boundaries of Russia, and the Russian Federation, even in an era when boundaries and the mapping of boundary lines are not only contested but increasingly without clear meaning. Putin’s involvement in aggressive actions beyond the borders of the Russian Federation–whether in the American elections, as all but certain, if of unclear scope; the invasion of Crimea and Ukraine; or in the elections of Brexit and Hungary, or poisoning of Russians in other countries, all distracted national bounds. But all were presented, in a cartographic sleight of hand, as a vision of Russia as a state of the twenty-first century. If our current maps no longer follow the “jigsaw puzzle” of the map that the icon of the luminescent map recalled, and the global reach of Russia’s missiles that he claimed could not be intercepted. Remapping the Russian Federation was the central take-away from Putin’s speech to the Duma–even while allowing that “we have many problems in Russia” with twenty million Russians living below the poverty line, described the need to “transform infrastructure” and claimed that Russia faced a significant turning point in its history, which would alter its relation to space. Indeed, the argument that Russia “had caught up” with the mapping systems that were used by the American military since the 2003 Iraq War–one of the first international conflicts that Putin had encountered as President of the Russian Federation–and suggested the lack of clear limits to frontiers, or anti-missile rockets to the global scope of a new generation of nuclear-power Russian ICBM’s. A statement of the resurgence of Russia–and a renewed defense of the foreign policy of the Russian Federation–all but erased or whitewashed Russian military presence in Georgia, Ukraine, and Crimea, presenting the arrival of Russia on a global stage through an awesome holographic map. 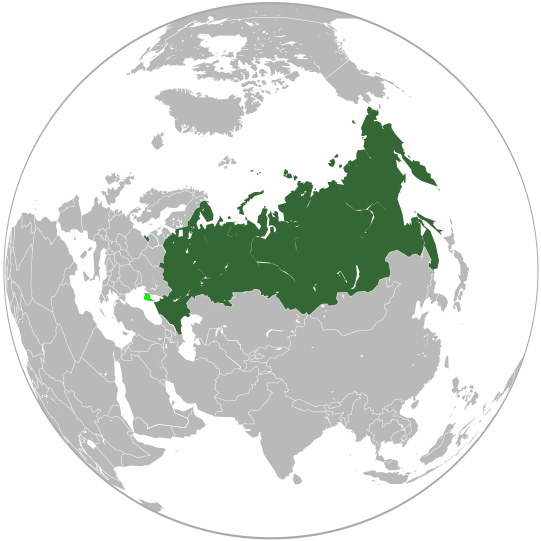 The map offered something of a “warrant” or guarantee of the arrival of the Russian Federation on a global stage, and provided viewers a reassuring image of Russia’s prominence on the global map, despite the fairly dire state of domestic affairs and the limited plans for expanding national employment or social welfare. The value of the map, mesmerizing in its illustration of the entirety of the Russian Federation, provided an illustration of foreign policy and argument of expanded powers of global intervention, by which Putin, former head of state security, sought to suggest its arrival as a ‘strong state’ despite the historical challenges and setbacks of earlier regimes, and what Putin has long seen as “the greatest geopolitical catastrophe of the century,” the break-up of the Soviet Union. The map met the need to bolster Russian self-esteem, and indeed identifying esteem with the territorial protection of “Russian rights,” irrespective of the boundaries that were drawn or existed on other maps. 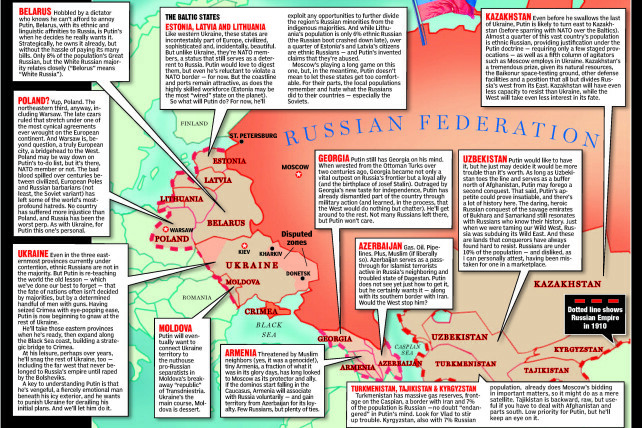 For while erasing Russian intervention in Chechnya, Georgia, Crimea, Kyrgyzstan, and Ukraine, the map sought to project an image of the consolidation of Russian abilities for “global governance” as an extension of Russian sovereignty. It is striking that the map was a reflection of the manner in which Putin had long understood or seen the invasion of Iraq in 2003 as an extension of American claims to sovereignty, in violation of international law, and the new image he wanted to create of Russia’s similar abilities to ignore national boundaries and boundary lines. The map affirmed the arrival of a new consensus in the Russian states and ethnic republics–members of which were assembled before him–to recognize the arrival of a new role that Russia could occupy and would occupy in the global map. Indeed, the made-for-television map of the Russian Federation suggested the new relation between local and global–and of Russian sovereignty and international abilities for “global governance” that would be guaranteed by an expanded arsenal of nuclear weapons, in ways that demonstrated the expansive reach of Putin’s Russia far beyond its boundaries, in ways that would upstage the American use of GPS in the Iraq War, and the precedent that that war set, in Putin’s mind, for flouting international law in the assertion of American sovereignty–despite the multiple logical problems that were avoided in making such a claim. But it seems that much as George W. Bush’s headstrong rhetoric of fighting “terrorism” was adopted wholesale by Putin in subsequent violations of the sovereign rights of Ukraine, Crimea, or Syria–and the justifications for defense of Russian interests as the same as sovereign grounds. The broadcasting of Russia’s possession of a new generation of intercontinental ballistic missiles, unable to be intercepted, as well as designed to frighten the United States or a feign to enter into an arms race, were presented as the basis for illustrating the lack of Russia’s need to respect any cartographic lines or continental divides. 1. The pre-election State of the Union address, as if a continuation of the diatribe Putin launched against the West for “trying to remake the whole world” unilaterally and in accord with its own interests, provided a broadside of the determination of Russia to defend its own interests, rather than seeking through military invasion or moving of its troops across borders to “reinstate some sort of empire.” But his discussion of how “turning points” in history determined the foundation of cities in Russia and its relation to “space” seem on the point–and a bit of pointed positioning in regard to Russia’s future positioning on a geopolitical map. Projected onto multiple scrims, the glowing image of the Russian Federation lit by glowing centers of population echoed Putin’s discussion of stability, and the need to affirm the “self-fulfillment” of all Russians and their welfare through new economic policies, which he assured them had nothing to do with the upcoming elections, but cautioned that the failure to create technological changes would lead to potential erosion of its sovereignty despite its huge potential. The glowing national map dominated the room overwhelmingly in which the three-term President spoke, describing the as he aimed to win an election to continue his Presidency through 2024, and convince all Russians of his leadership of the nation. Below the map, unsmiling, Putin solemnly addressed the nation as if he were its architect and the protector of its bounds; indeed, the projection of the fixed bounds of the Russian Federation onto a set of screens behind him seemed to celebrate its continued power vitality after three terms of Putin’s presidency, even as he recited fairly grim statistics about the state of the national economy. Describing the need to enhance its civil society and democratic traditions, Putin raised the prospect of once again “lagging behind” other nations, its body politic undermined by a chronic disease, and define Russia’s future, if its modernization was not affirmed in the face of . The continued coherence of the nation reminded viewers that, notwithstanding threats of dissolution after the fall of the Soviet Union two decades ago, and a reduced GDP and natural resources, the Russian state was back. The map of Russia was projected in isolation from the world, but the image that resembled a back-lit glowing screen became a basis for projecting the power Russia had regained on a global stage. Rather than imitating the graphics of a paper map, the iridescent blues, splotched with centers of population, called attention to the permanence of the Russian Federation’s borders and affirmed its new place in the world. The bounds of Russia were protected, the triumphalist image implied, but the place of Russia on the world stage was implicitly affirmed even if it was shown in isolation: rather than showing people, or including any place-names, the map magnified the idea of Russia, and its futuristic projection suggested the continued power of Putin to transport the nation to modernity, its boundaries protected and affirmed and its defense of allies acknowledged. While Putin had recently accused the United States of triumphalism, insisting that Russia was indeed “self-sufficient” and denying Russia was “encroaching on its neighbors” as “groundless,” he seems to have relished a new triumphalism, and famously continued to present the invincible military weapons Russia had developed–lasers, ICBM’s, which, nuclear torpedoes, and nuclear-powered cruise missiles–which, while not revealed “for obvious reasons” would definitively displaced the United States from a position of global power and could penetrate US Defense Systems with ease..
“Nvogorod [is] the village where my grandparents were from in Belarus,” clarified Jared Kushner in the eight page of his 11-page testimony to the United States Senate, seeming to intend to reference Novgorod, but not following the best lesson in Belarusian geography or Kushner family history. In describing an ancient Russian city somewhat near Moscow but long part of Lithuania that was the residence of many Jews, Kushner seems to have revealed his hazy purchase on a site dear to his father Charles, whose parents had once been members of the city’s large Jewish community. Kushner’s admission to receiving a ceremonial “bag of dirt” from Russian banker Sergey Gorkov not only played down its ceremonial status quite adroitly–“he gave me two gifts–one was a piece of art from Nvgorod, the village where my grandparents were from in Belarus, and the other was a bag of dirt from that same village”–but seemed to obscure whatever significance it might have by underscoring its incidental nature for a public audience. Kushner’s orthodox religion is well known. But he cloaked whatever significance his family might have assigned the dirt–and whatever Gorkov thought he was doing carrying the earth to New York City–a bit too smoothly. Kushner’s grandparents had fled the walled ghetto of Novogrudok in 1941, as the German troops arrived in the city near Minsk, to join a Jewish partisan squad in the Belarus–escaping the ghetto via a tunnel of over two hundred yards dug over weeks by his brave grandmother Rae, then seventeen, with her brother Chonom, below electric fencing surrounding the ghetto, a conduit through which some 350 Jewish men and women fled the ghetto to nearby forests. The path of her flight from Novogrudok in the underground tunnel she dug commemorated by an overground path and in the Museum of Jewish Resistance situated in the tunnel which the Kushner family has long helped to support with its deep pockets. Rae arrived in Czechoslovakia, months after clawing her way through the tunnel with her brother, using hand-made instruments to tunnel to escape Novogrudok’s ghetto, and she probably had little attachment to her place of birth or its non-Jewish residents. Jared conflated the name as Nvogorod in somewhat surprising ways. For Charles Kushner, Jared’s father, preserved the memory of Rae’s escape on family journeys there with his sons as they reached adulthood, presumably before their Bar Mitzvah; somewhat predictably, given these ties, most Belarusian media openly crowed over the arrival of Kushner, given his ties to Belarus, in the Trump White House. And so it made some sense for the head of Russia’s state bank, the Vnesheconombank, to arrive to meet Jared Kushner in New York before the inauguration bearing a bag of dirt from the town that the Kushner’s had maintained a close tie, but which Jared seems to have misidentified. Perhaps for Jared, the memory just didn’t stick, partly due to the differences between the Belarusian place-name from that transmitted in Jewish memory and the Russian toponym: Kushner’s testimony to Congress described his family as hailing from the authentic-sounding but imagined hybridized non-place of Nvgorod, notwithstanding Charles’ best intentions, rather than Navahrudak,–a city is in fact much closer to Minsk, Belarus’ capital, than Moscow, and pronounced quite differently. Eager for how Trump has been portrayed in Russian media that is widely consumed there, even while noting the clear similarities between local strongman Lukashenka and the prominence of faux populist themes in Trump’s Presidential candidacy, the notion that “Of course, Trump is closer to Russia–and hence to us,” even if little trade between Belarus and the United States seems likely to emerge. Rae, of course, understood her own town as in north Poland in a community of 6,000 integrated but religious Jews, possessing an independent yeshiva, hospitals and strong cultural life, and were often schooled in Cracow; her hat-maker father shared a particular antipathy to Poles, who treated the family badly. Rae intensity in digging that tunnel to safety and survival from the Novgrugok ghetto that may reveal the intensity and tenacity of the Kushners. But Jared’s geographical vagueness ended up trying to place this “village” in a major Russian city, probably as the intent of the gifts was basically to suggest his ostensibly Russian roots. While Jared Kushner tried to cast the arrival of a bag of soil from Belarus as “the normal course of events in a unique campaign,” it fit into a plan to encourage US-American friendship, although it was cast by the not-so-quick-on-the-symbolism Kushner as “a bag of dirt,” which he probably threw somewhere on the White House lawn. The imperial imaginary that the trans-Atlantic transportation and presentation of soil from Mother Russia must have had some meaning for Gorkov or his compatriot Kislyak didn’t have much truck with Kushner, for whom Gorkov remained but a “banker” and Moscow existed as a Trump-friendly place, rather than ever having been an empire. What all the symbolism of the soil might have meant to Kushner is most unclear: if someone in Moscow must have taken the classy banker, with western tastes, as best able to display a sense of kinship to Trump’s son-in-law, who had so tried to cast himself as a cosmopolite from New York, the Kushner’s much-vaunted orthodoxy is perhaps the best known thing about him save his problematic relation to the New York Observer. While Trump’s cultivation of the legend of the “assassination attempt” seemed a media ploy, and appeared conveniently timed, it seems to have been interpreted in some circles as a benefit of a back-channel Jared had opened by gaining the blessing of the immortal Rebbe, whose favor for the Father-in-Law was evident in his life-saving intervention. The sense of intercession perhaps provided some sign that the orthodox Kushner would appreciate receiving a bag of Belarusian earth later brought to him from Belarus by Sergei Gorkov, chairman of the Russian VEB, or state-owned Vnesheconombank, or ‘Bank for Development and Foreign Economic Affairs,’ still under United States sanctions for its involvement in Ukraine–whose cash flow has recently turned negative, as it holds increasing state debt. When Gorkov arrived at the meeting bearing gifts of particular significance, as Kushner innocently recalled, as if he did not recognize the care that Gorkov hoped to communicate by selecting such items as a sign of his interest in the boy prince: “a piece of art from Nvogorod, the village where my grandparents were from in Belarus” and, curiously, “a bag of dirt from the same village.” If only mentioned in passing to show their lack of any suggestion of collusion, the specificity of these gifts the revealed the research and sense of familiarity Gorkov took care to communicate to young Jared, suggested the message’s importance, though what it said hasn’t been clear. Vnesheconombank has long focussed on Russian exports, and it was perhaps recalling this function that Gorkov, deeply tied to the Russian FSB and apparently having cut a deal with them, in December, 2016, brought a bag of Belarusian earth to the orthodox Kushner as a highly symbolic–and oddly personal–note from a man Kushner would only saw was important to meet since he was “someone with a direct line to the Russian President who could give insight into how Putin was viewing the new administration” at the time Kushner sought to set up a “back-channel” to Moscow. In a December 12 meeting with Kushner’s assistant, the promise of meeting with Sergey Gorkov–who Kushner described as just “a banker and someone with a direct line to the Russian President who could give insight into how Putin was viewing the new administration and best ways to work together,” rather than a state agent with complicated ties to the Kremlin and head of Russia’s largest economic stimulus agency, funded directly by the state budget and a tool go national leadership–with a branch in Nizhniy Novgorod, not Vileky Novgorod, but raising questions of whether Jared might have mis-recognized the city from which his family hailed with this branch location. Jared Kushner’s sense of innocence is not only an odd contrast to Gorkov’s tenacity. He seems to have been played with through the promise of ties to Moscow for the incoming administration, and his ambitions for a Russian Reset through his own backchannel. Kushner felt “Ambassador [Kislyak] has been so insistent” that he meet Gorkov “because Mr. Gorkov was only in New York for a few days.” But it’s hard to believe Kushner didn’t Google Gorkov before their half-hour meeting; Gorkov seems an attempt at an evocation of kinship if the presentation of a bag of Belarusian earth wasn’t recognized as a carefully planned sign, as well as a talisman by which Gorkov must have believed the diaspora Jew would be affected as a signal of his respect and recognition of Kushner’s tie to the city–although most Jews in Belarus’ ghettoes dreamt only of Eretz Israel in 1941–in ways that Gorkov may have believed analogous to the treasured earth from the Mount of Olives kept for scattering over burial sites in the diaspora, but remained a powerful symbolic tie for Jews before the war. 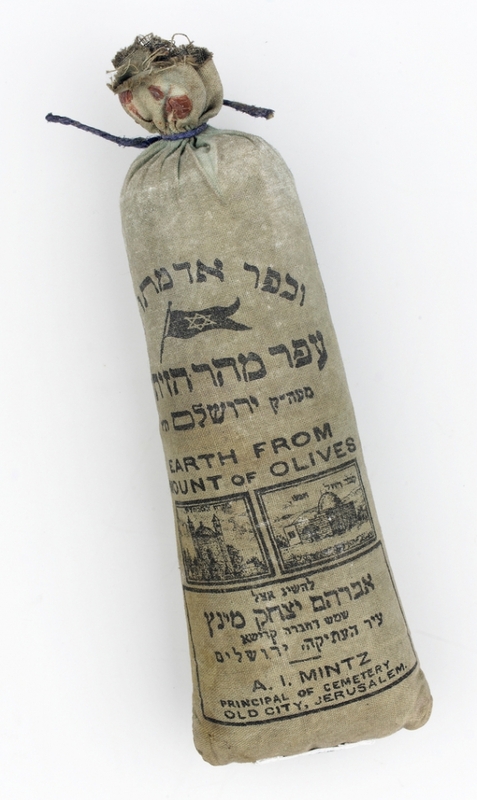 The bag of soil from the land of Kusher’s forefathers was rich with a symbolism that didn’t grab Kushner’s attention or his sympathy nearly as strongly as Gorkov and his circle had hoped. Of course, Belarus is not in Russia, but in the former empire; even if Gorkov would claim clear access to the city in the former Soviet, even if it was “close to Moscow” and militarily tied to Russia, their bonds aren’t clear. Did the “gift” of a bag of soil from the former imperial territory of Mother Russia which Kushner received in mid-December in New York City a proposal that the new administration in which he was to playa prominent role recognize Russia’s relation to the nearby city, and, by analogy, to Ukraine? Putin’s hopes to regain old imperial lands within the new Russian Federation is rarely openly stated or so prominently mapped, the presentation of the token of soil from outside of Russian bounds but in the old imperial territory recalls the hopes to recover a notion of nationhood rooted firmly in the nineteenth century–long predating the USSR. Reclaiming land outside of current state boundaries is closely tied to the mission statement of the VEB and to the “blood and iron” image of Russian Empire in which Estonia, Lithuania, Belarus, and Latvia are central as part of the Baltic States. The presentation of this earth was part of a geopolitical vision, as well as providing an oddly off-beat appeal to the Jewish origins of Trump’s most trusted Presidential advisor. Whatever the answer, the Special Assistant to the U.S. President only remembered the considered gift as a “bag of dirt”–without attaching symbolic or spiritual significance to its presentation. But the gift seems to have been carefully selected by Kushner’s visitor, probably with high-level approval, and the consideration about transporting a bag of earth from a region from where his family hailed seems intended as an attempted tie of affection. It also might reveal a bizarre post-Cold War political geography, seeking to create dialogue with the faith of the orthodox Jewish son of a real estate magnate in New Jersey in ways that carried messages about Russia’s newly expansive claims over areas of central Europe once part of the Russian Empire. The centrality of Belarus to the Eurasian Economic Union has become increasingly clear, although Belarus is not eager to accept Russian annexation of Crimea. Why the head of the VEB decided to carry a bag of dirt from the former imperial territories, if not in the hopes to end the sanctions that had hurt his country, as well as to establish Russia’s prominent place in the EEU? VEB described the meeting as part of its ‘development strategy,’ rather than an innocuous encounter. Gorkov seems to have been sent to meet Kushner as something of an analog–a modern businessman–who Kushner would recognize, as not brash if owning two Porsches and a Mercedes Benz, both more worldly, down-to-earth and western than most oligarchs, and closely tied to IT, as well as being a tough deal-maker able to close agreements. The VEB presents a unique view of the Russian Federation, as well, mirroring geopolitical ambitions, closely tied to the Eurasian Economic Union. The relations between the countries were not easy, and long fraught, as Belarus sought to position itself with new alliances. Russia’s Sputnik railed against Belarus; in a July 9 article entitled ‘The EU’s “Eastern Partnership” Threatens to Turn Belarus Into a “Second Ukraine,‘” published by Russia’s government-affiliated Sputnik in English, to struggle against the transformation of “Minsk, following Kiev, into an instrument of anti-Russian forces” by the ‘siren call’ of the “forces of globalism and modern-day fascism,” embodied by the EU’s ambitious Eastern Partnership. Gorkov would have been familiar with the same sentiments in December, and was irked by the annoyance of Belarusian neutrality. But Lukashenko may not have much choice, even if he is one of the world’s few remaining dictators. Did Kushner? Kushner may have professed to have not known what the meeting was “about,” but the longstanding fears of secret Russian involvement in the spread of ultra-nationalist parties in Belarus, apparently to destabilize the government of nationalist strongman Lukashenko by fomenting non-violent governmental change, revealed Putin’s attempt to influence the former Soviet republic run by the former leader of a Soviet, who cannily maintained his power while affirming independence from Putin’s Russia. Belarus is treading a fine line of independence, foreign economic cooperation with the Eurasian Economic Union is something the European Union is far more interested to pursue than, say, VEB; Russia would also very much like to see the EU sanctions lifted on trade. Lukashenko’s nationalist proclamations, and rejection of Russian as a state language and use of Belarusian–“We are not Russian — we are Belarusians“–heightened tensions around trade disputes on energy pipelines, prices, and transit of gas to Poland and the European Union. The question is not whether bright eyed Jared Kushner colluded–a term without definite legal meaning, but how he failed to pick up on an invitation for colluding, and why he missed it. Unless the mention of “Nvogorod” was more than a slip, and a signal of some sort of rejection of a proposal that didn’t seem worth the attention Gorkov had hoped. But Gorkov and his superiors clearly had some other level of collusion in mind by inviting a tacit recognition of a proximity akin to kinship over a month before the inauguration, and seem to have been looking forward to a newly proximate sort of relation to the thirty-six year old advisor to the incoming President: Kushner’s title as Senior Advisor was made official on January 9, reportedly without salary, before being named to head an Office of Innovation, although the Russian government seemed to anticipate his unexpected role as a sort of “Shadow Secretary of State” far more powerful in the administration than a Special Assistant. Despite insistence of no “improper contacts,” the propriety of the bag of Belarusian soil might be questioned beyond its clear symbolic value. For a President who had promised “improved relations with Russia” and committed to “make a deal that’s great” not only for “America, but also good for Russia,” the stakes were probably pretty high, and Gorkov’s mission on December 13 would have been delicate, probably involving the immediate loosening of sanctions. The absence of any actual meaning in criminal law of a term like “collusion” suggests that his denial was a way of dancing around the issue, or just of keeping the conspiracy vague. Kushner is quite well-connected to Russians, and particularly Russian Jews with ties to Chabad, and perhaps over-eager for an Orthodox Jew to lump Russians and Jews: he is closely tied financially to a real estate money launderer of Russian heritage and birth, Lev Leviev, a colorful Uzbeki who allegedly transferred the skills of his father, a mohel, to diamond cutting, to which he dedicated himself after leaving a Yeshiva two months after he began his studies in Israel, who helped Kushner out with some massive loans and real estate transfers–including the purchase of the former New York Times building–and was until recently involved in construction projects in the West Bank and East Jerusalem: Leviev, known as the “King of Diamonds,” amassed an empire around the importing, cutting and polishing diamonds from Angola, Russia, and Namibia in Israel and Russia, raising many questions about the labor practices in his mines: despite trepidation returning to the former Soviets and Russia, Leviev did so after the intervention of none other than the Lubavitcher Rebbe Schneerson, who earnestly encouraged him not to forget his fellow Jews,–perhaps a banality that assumed some significance in his career. Leviev not only continues to be tied to both Putin and Chabad, and is a partner of the Russian Prevezon Holdings, who recently settled a money laundering case in the United States on light terms and was under investigation for some time by the office of Preet Bharara. The weird geography of international finance overlaps in odd ways with Rae Kushner’s heroic escape through a tunnel she dug through Belarusian earth underneath the walls of the ghetto of Novogrudok to escape from the ghetto has been improbably linked to the playing out of a conspiratorial drama of international proportions, in which a bit of Belarusian soil was brought, some seventy seven years later, to New York City, maybe as a carry-on item of the chairman of VEB, to be presented as a “gift” to Rae’s grandson. This wasn’t a simple gift, and was carefully selected. But if the bag of soil somehow procured from Belarus–and specifically from “the village where my grandparents were from in Belarus”–before being brought to an off-the-record meeting with the trusted adviser who was already central to Trump’s transition team as VEB feared facing the continued imposition of sanctions over Russia’s invasion of Crimea. The desire to lift such sanctions immediately raises questions of the propriety the “gift.” “He told me a little about his bank,” Kushner testified to the Senate while not under oath, “and made some statements about the Russian economy.” Was the discussion not apt to range to topics closely related to the issues on the table for the bank, and did the oddly misplaced attempts to tug at Kushner’s heart strings not suggest a tone-deaf “restart” button? The anthropological oddity of the offering of earth, as much as a considered gift, not only fell on deaf ears but seems to have misread the ties to Novogrudok as a family residence. Much as the activities of VEB are not those of a regular bank, or even a bank, the relationship they sought to cultivate with Jared Kushner had little propriety at any event. We’ll probably never know about whatever statements Gorkov made as he presented the bag of Belarusian soil which later became a “bag of dirt.” The new descriptor diminishes its symbolic significance, and paints Jared as having made time in a busy schedule for an amicable meeting. But it’s hard to believe that the symbolism was not lost, or that Jared could even consider placing the Belarusian earth atop Rae’s grave. Despite the deep paradoxes of Rae’s grandson placing earth reminiscent of the very earth through which she had clawed out of the ghetto over her final resting place in New Jersey–wouldn’t Rae have scolded him with some incredulity?–whatever the hopes of the higher-ups of VEB, they seem to have escaped Kushner. The late Rae Kushner had quite vividly recalled–and which she must have described in terms Jared must have often heard her retell–the blood-soaked earth of the shooting of the Novogrudok suburb where many of the 30,000 men and women brought from a ten mile radius around the city–after soldiers executed Jewish doctors, teachers, and lawyers in 1941 in a public square in a suburb of the city, staining its paving stones with blood as an orchestra played, Rae was brutally ordered to wash the stones in preparation for a public ball in the city. While an articulate woman, she would probably have scolded Jared wordlessly for accepting the bag of earth as if it were a friendship offering. The location of the earth was very significant to the Russian Federation higher ups, if its significance or sybmolism may have passed Jared by. As Russia seeks to expand its imperial past, presenting the gift of a bag of earth from the old empire seems more of a demand to recognize the new geopolitics they intend to pursue. Such are the perils of having advisers without experience in international politics. Such is also the bizarrely shifting map of a post-post-Cold War world, where VEB hopes to forge ties to a new American administration by offering something close to a caricature of nourishing a spiritual attachment to a place of origin in the service of expansionist ends–as if transmuting Kushner familial pietas to affirm an expanding Russian military presence in what was once Eastern Europe grater than since the Soviet Union collapsed. The notion of appealing to Kushner’s alleged Belarusian roots seems a poorly judged symbol, but it was a potent one for a Russian Federation eager to remap broader European influence. Gorkov’s presentation of this bag of dirt might not have been recognized as a statement of geopolitics, but suggests one: it paralleled the long-planned military exercises of Russian military presence in Belarus and along the NATO border–a zone of influence on the western front of the Russian Federation–or “Zapad”–defended with increasing aggressiveness from 2014 with surface-to-air and anti-ship missiles, from around the same time that Putin directed increasing attention to destabilizing the European Union. The planned 2017 military exercises of 60,000-100,000 air and naval units to be held from September 14-20, around the Baltic and North Sea, is widely seen as a test of NATO’s interest in protecting its member-states of Lithuania, Latvia, Estonia, and Poland–and Donald Trump’s interest in endorsing Article 5 promising NATO’s collective defense. The Zapad exercises of staging a staging a military invasion of the Baltic without allowing any outside observation of the same 800 tanks involved in the exercises that appears a clear show of force in the very region from which Kushner’s family hails. The longstanding exercises of the Russian military in the “Russian West” have acquired increasingly offensive tones. Recent “Zapad” exercises of the Russian military in 2017 that are based in Belarus–and although the joint exercises Russia and Belarus will conduct to simulate a NATO invasion will pack in an unknown number of troops and although Belarus is not eager to accept many more permanent Russian troops, Zapad 2013 involved an uncertain number of troops–Russians declared “12,000” or perhaps “12,500,” but reports indicating the presence of up to 75,000 boots on the ground, as Belarus became something of a military staging ground for Russian strength–if not in actual preparation for the invasion of Crimea that occurred shortly afterwards. –will include the greatest number of military troops to be involved in a military exercise without the observation of international observers, in ways NATO observers increasingly see as a hostile threat–if not, as Chatham House speculates, leaving a permanent military contingent in Belarus. While the stationing of troops might not occur, the threat to destabilize the European Union, a pet-project of Putin from 2015, the expansion of military presence seems an open reclamation of Russian earth. Where Is Ukraine? What is Ukraine? “In Ukraine, there are no problems,” sternly reprimanded a Swedish customs agent in Stockholm’s spotless Arlandia airport who herself had left Kiev over twenty years ago. After I had ventured to ask her about her native country after she had had fun asking us five questions about our favorite Swedish food and why exactly we were in Stockholm, she sternly noted, “Problems are on border, . . . across border, where they always are.” But what are the borders of Ukraine, and where exactly does over the border lie? Regional maps of Ukraine–and of the region of Crimea–are inevitably filled with their own narratives, most usually of the ethnic and cultural division of the region. Maps of the region’s populations implicitly pose the question of where the region’s unity in fact lies, or from where derives, as if to question the validity that the post-Soviet nation could ever gain, even under the best of circumstances. The map of Ukraine’s population becomes a mirror of disunity, by mapping the linguistic and ethnic groups in the region, although such a division of Ukraine is only using the results of long-term plans of Russification that were designed to promote an image of national unity for Russians that is manufactured as a retroactive justification for invasion. For although such images of ethnic regional fracturing recall the multiple maps of national divides with which we’ve been inundated, the veneer of democratically determined ethnocentric or linguistic parcels that they create are a false mapping of the regional divides or sovereign boundaries of a state. The increasing number of visualizations mapping ethnicity and political preference mirror the disunity of the region in ways that have an oddly libertarian undertone–and is particularly pernicious to the sovereign unity of a state. Even if they don’t all explicitly advocate or question secession, the explicit fracturing of Ukrainian unity, such as it is, exploits the importance of ethnic-regionalism in ways that are harmful if not toxic to democratic practices. Indeed, Ukraine provided something of a start for Vladimir Putin’s regime to stoke separatists and racialists in annual conferences since 2014, under the aegis of the Anti-Globalization Movement of Russia, headed by Alexander V. Ionov, under the fraudulent title of a The Dialogue of Nations. The Right of Peoples to Self-Determination and Building of the Multipolar World. For although term “deglobalization” has gained currency as a critical tool against international business and multi-nationals, the “Dialogue of Nations” promoted at the conference is less of a critique of global capital than a championing of ethnic divisions among parties who hold positions that are deeply undemocratic in tenor, and less promote the stated goal of “sovereignty for small nations around the world,” than to question nations’ existing borders and independent sovereignty, inviting and promoting such groups as the Texas Nationalist Movement, the anti-Iranian Talyish Revival Movement, or National Sovereign State of Borinken. Such hopes to champion regional interests under the banner “self-determination” constitute a sustained subversive regional nationalism seeking to divide liberal consensus, in ways that have provided something of a deep precedent for Russian sponsorship of Donald J. Trump and Russian Ukraine, or Novorossiya, in addition to the Brexit movement. For if the sponsorship of such meetings stands in odd contrast to the themes of Russonationalism, and includes members of the smaller states outside the boundaries of the Russian Federation, including Ukraine, Georgia, Moldova, Azerbaijan and Armenia, who it keeps in its orbit effectively by increasingly stoking their own divides. And although Russionationalism is often invoked to justify the invasion of Ukraine, and the overturning of a democratically elected President, returning to maps of ethnic division muddies questions of the military invasion of Ukraine occurred, and offer seizure of Crimea unwarranted and unwanted justifications. 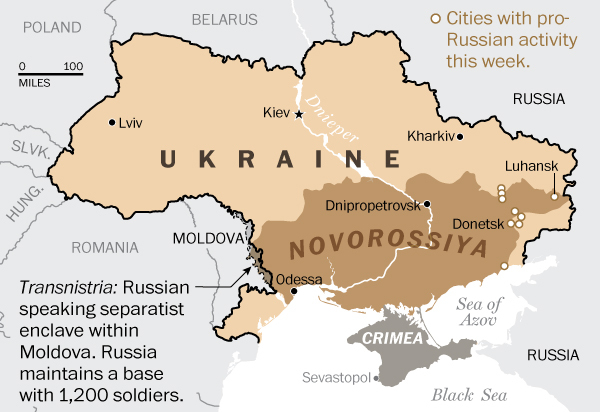 The steady cross-border entrance of support for the separatist pro-Russian rebels over the summer of 2014 proceeded largely from military bases located on the border, as a stream of military support to rebels in Ukraine undermined the question of its national sovereignty in particularly disrespectful ways. 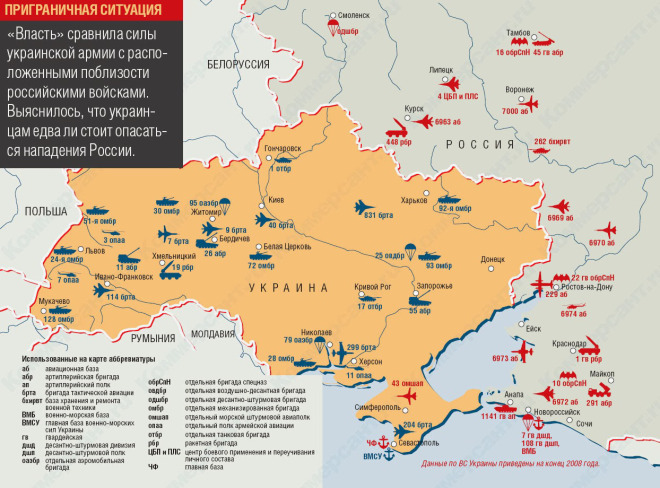 Russia made its military presence increasingly known to Ukraine, in an openly bullying manner of shooting jets, supplying separatists arms, and crossing the Ukrainian border at several undefended sites. Questions of what are the actual “true” borders of Ukraine may ignore the question of its tactical importance as an area of contesting global energy flows. Indeed, as much as there existed any enmity or opposition for many to Ukraine as a political entity, the crucial place the region occupied in the energy reserves that Russian held may have made it increasingly desired as a site of political control, in ways that the debate over Ukraine’s politics seem to have served as a smokescreen to conceal. For the manufactured war against Ukrainian independence seems to proceed less from the protection of ethnic Russians, or the survival of the Russian language and cultural groups whose dominance in Ukraine was encouraged in the Soviet Union, than the cold economic interests of securing a continuous pipeline for oil transport on the ground. The redrawn boundaries of Ukraine might take into account where the Ukraine actually lies, but to understand their contestation one might do better to map the global ties that have reconfigured not only the place, but the political and economic stakes that have directed new global attention to that region. How might the global dynamics that have invested Ukraine with compelling global interests be best mapped? The stakes are great. So much seems increasingly important as, despite the UN’s declarations that the internationally recognized boundaries of Ukraine must be respected, the precedents for those borders and boundaries turn out to be messier and more unclear than one would expect–and the hold of the Ukrainian government over these borders become difficult to assert, with several of Kiev’s border posts physically abandoned by soldiers and undefended. Increasingly, Ukrainian border checkpoints became porous to Russian troops. With the borders being wiped off the actual map as the result of outright intimidation, what, one is tempted to ask, is Ukraine–and where does it exist? From the point of view of Vladimir Putin, her poised in his Palace in 2006, the Crimea is presented as native “Russian land.” Its 2014 annexation was promoted as reclaiming a region long part of a Russian Empire-and not only as inhabited by linguistic or ethnic Russians, whose scarlet boundaries seem to place its entire topography beneath his eyes: and in ways that prefaced the Russian role in the eastern Mediterranean and Syria, expanding its ties to warmer seas through its extended intervention in Syria’s Civil War, the importance that Putin’s Kremlin has placed on Syria’s prominence as a point of entry into the Middle East’s geopolitical landscape was prefaced by the warm sea outposts that Crimea–and Ukraine with it–offered the Russian military both to delegitimize a democratically elected government, and secure its ownership of gas pipelines through Ukrainian soil, not pictured in the below map. The bleeding crimson boundaries of the Russian Federation are indeed more prominently highlighted than any city, region, or old soviet state, as if to insist on the naturalization of the integrity of its borders, and erase any other borders–quite tellingly–from the map. 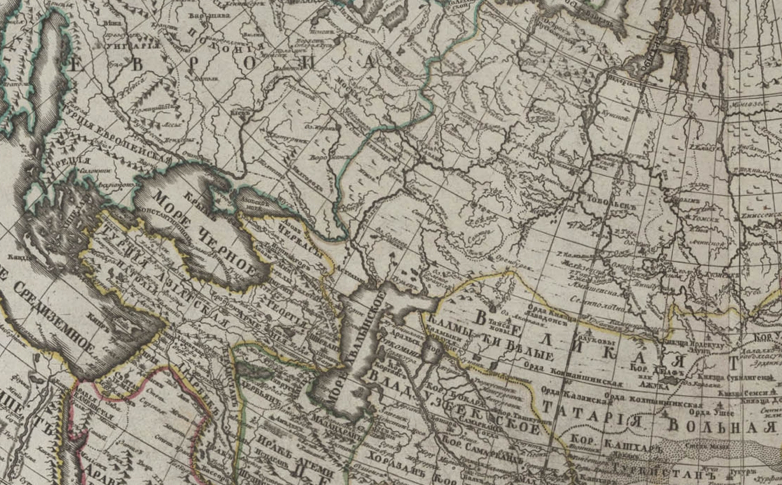 Putin has demonstrated considerable affection to romancing the map as a fiction of state boundaries, recently presenting Moldova’s President, Igor Doyon, with a late eighteenth century map of Moldova drawn during the Russian-Ottoman War by Italian cartographer Bartolomeo Borghi in 1791, which he noted to his Moldovan hosts showed the undeniable truth that “Half of today’s Romania is actually Moldavia”–to the considerable annoyance and consternation of many in Bucharest, who bristled at the apparent disinterest Putin showed for Romania’s territorial integrity. (The gift was successful in its effect: Dodon viewed it as an occasion to lament that the Russian Empire, back in 1812, had annexed what was then Bessarabia, but stopped short of the Carpathian mountains at the Prut River, and later announced before Putin left that his party, should it gain the majority, was committed to shifting his country away from EU ties.) And when the single mother Yekaterina Vologzhenova decided the she would repost a cartoon showing a Putin lookalike looking at a map of the Ukraine, focussed on the city of Donbas while holding a large knife Putin poring over a map of Donbas, knife in hand; the single mother was sentenced to 350 hours of community service for “internet extremism” for sharing an image that suggested that Russian forces were behind the loss of much of the Southeastern Ukraine’s territory, and suggesting President’s mania for maps; the government ordered her lap-top computer to be destroyed. The image of the President before the map suggested a sense of restoration of past borders, and a sense of romancing territorial integrity as if it were removed from state interests or personal advantage–using the map as a mask, similar to Putin’s caution that the anger of the Ukrainian government at Russia for its loss of Donbas in the southeast were related to Moscow, lest they “take a stand-off between Ukraine and russia to a higher level”–since “no one needs an armed conflict” on Europe’s edges. But the claims for Russian ties to Crimea and Ukraine–and illustration of Russian military might in the Ukraine’s invasion–used assertions of ethnic nationalism as a basis to place Russia in a position of strength in the national news, and assert its relation to Chechen and Crimean neighbors, and parade the strength of military hardware in so doing. In so doing, the Putin government is remapping the Crime as part of an expanded Russia, using Russonationalism to deny or ignore the Budapest Memorandum of 1994 to “respect the independence and sovereignty of the existing borders of Ukraine,” but remapping the region on Russia Today as lying in the boundaries of an expanded Russia whose military might is right–as a decision of local ethnic Russians–in the hope to assure a continued tie to the shipping and piping of oil outside of its borders. The scrim of a Russia Today set showed the new configuration of the Crimea as a part of Russia once again, joined to its expanse of yellow in ways that left room open for the continued violation of Ukrainian sovereignty under the illusion of a false democracy of a referendum to rejoin the Russian Federation: the vote, which offered the possibility of independence or integration with Putin’s Russia, in response to the ouster of Ukrainian President Viktor Yanukovych was immediately remapped as an expansion of Russian territory by popular demand, even as the plebiscite was held as Russian soldiers occupied the peninsula. 1. Putin’s tie to the prominent topographic map that is displayed in his residence–a map that seems to naturalize political boundaries, and is oddly without any clearly visible names, but includes striking national borders, provides a site before which he seems eager to be photographed–as if to suggest his keen study of the geography East of the Urals, as much as his care to the Russian nation. The relation of Ukraine to the Russian Empire and nation is complex–and goes back to the secession during the Revolution, when the region claimed an independence that has become far less clear in its national or linguistic autonomy. But the enmity between Russia and Ukraine is over-exaggerated. While the Ukrainian Republic that seceded from the Russian Empire was greater than the now seceded region–the area had been significantly “Russified” as a Soviet Socialist Republic, whose ethnic or linguistic autonomy was attempted to be erased–if not denied–to integrate the region into the Russian historical lands, as if to erase the scars of the splintering of Ukraine from the Soviet state and from “European Russia” after the 1917 Revolution. Despite the importance of this historical legacy, the spatial importance of Ukraine to Putin’s government has much to do with the geography of energy and oil pipelines for Gazprom and the Russian state–to recover national claims of Russia to the region are tried to be magnified more than are seen as a part of Russia’s identity. Yet the remapping of the region is often cast as an integral whole. And so when Putin gazes quite icily if somewhat longingly at the regions that extend to the Black Sea, but exclude Crimea, in the large topographic wall maps of his Presidential Palace outside of Moscow, it is pressing to consider what sort of region he saw, and what continued Russian presence–cultural or linguistic–existed in the region he was so ready to invade. The creation of a newly independent Ukraine more closely tied to the European Union would be so close to Moscow evoke a Cuban Missile crisis like setting, reviving deep Cold War fears–even as it would reaffirm the cultural independence of the region, the image of a repeated division of Ukraine from Russian state seemed to undo its longstanding Sovietization, and to return to an image of Russification that was first cultivated by Peter the Great, or cultural assimilation of non-Russian minorities in a fictive map, and can be traced as far back as to the sixteenth-century Russification of the newly conquered Tartar Khanate of Kazan (which included the former Volga Bulgaria) and extended to become a state policy, and was most present in the marginalization of non-Russian languages, the use of Russian as the sole language of government, and Christianization, but included the marginalization of local memory, which increased the large number of endangered languages in the current Russian Federation, as well as the effective persecution of indigenous minorities in ways that intensified in the Soviet Era: forgotten languages of Komi, Mordvins, Volgic Finnic peoples, Belarusians, and Lithuanians were reduced to symptoms of its implementation–and in Ukraine led Peter the Great of Russia to issue a blanket decree in 1720 designed to expurgate any evidence of Ukrainian language or theological treatises from typographical houses in the region, making ethnic nationality virtually supervise; Catherine the Great similarly ordered a program of rigorous Russification for Ukraine, Livonia, and Finland–allegedly using light-handed methods, and remapping Ukraine as “Novorossia” to indicate its subordinate nature of its possession. 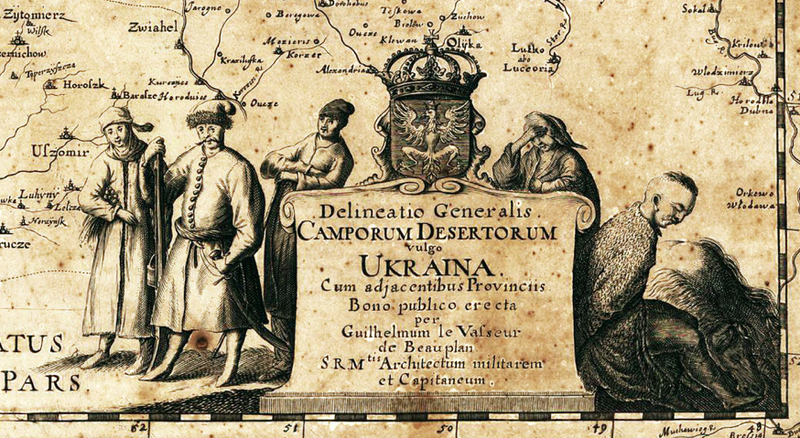 The renaming of the region not only absorbed Ukraine as a territory, but tired to erase Ukraine’s cultural memory. 2. Even if much as it is tempting to see Russian invasion of Ukraine through the lenses of a Cold War, as Putin seems to want to suggest, and a deep desire of Moscow to keep ties to former Soviet military bases as a sort of buffer zone, it seems in fact the renewed economic importance of the region’s stability to the transport of gas and oil that has produced the increased insistence on the integrity to Russia. For the fraudulent claims to ethnic protection conceals the emergence of a new global geography of the energy market, where boundaries are less based on the demarcation of united ethnic units or political bodies than the ways that gas has increased the value of those and adjacent lands. Mapping the region of Ukraine and nearby lands demands situating the region’s boundaries in a global context of economic value, where economic transactions and activity are often bound up in the growing value of the gas pipelines that ran across its territory. Rather than to fall back into categories of the Cold War, or inherently Russian qualities of regions of the post-Soviet state, even if these might line up with recent politics, we might do well to explore other reasons for interest in its redefinition on a map. –and reflect the political divisions of its landscape of the supporters of Timoshenko and Yanukovich, a basic fault line across the region’s terrain that seems to threaten its integrity and division in separate blocks. But the clear lines that are drawn between dominating parties and political persuasions in these choropleths draw far clearer divisions in the integrity of the region than might be useful as tools of analysis, and they might be better taken as starting points than as coherent projections of data. These maps place their viewers at a distance and remove from the increasing strategic importance of Ukraine’s boundaries in a post-Cold War world, which is perhaps more defined by the circulation of regional capital and energy from the growing number of gas fields and already built pipelines than the positioning of military material. Indeed, these maps of regional divisions oversimplify the potential actual reasons for military invasion, as do analyses that seem to privilege fears of Russian deployment of ICBM’s within a Cold War scenario, in which the placement of tactical weapons lead to the escalation of a war of conventional aggression into nuclear weaponry, by removing the region from the new reasons for the tensions surrounding its coherence in a growing market for natural gas, and relying on recycled narratives of the Cold War. The annexation of Ukrainian land is striking since not really about geography, or territory, in ways that are able to be quickly reduced to the surface of a map. And although Russia’s Federal Border Guard Service continues to insist that it allows no one to enter Ukraine illegally, with the Ukrainian post sitting some two miles within the official border, the apparently porous boundary between the two states–as the boundary between Ukraine and Belarus–is far less clearly defined than the boundaries appear to be on the map. 3. To effectively carve up a country in a delicate balance of power and global economy is exceptionally dangerous. 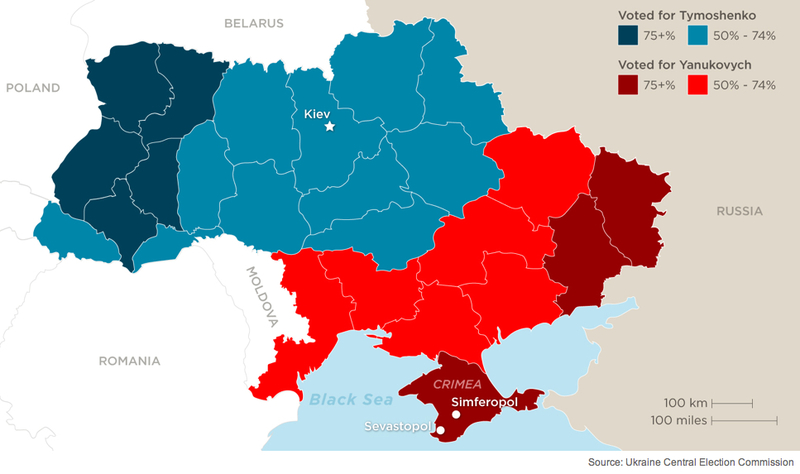 The variety of choropleth maps that depict the ethnic, linguistic, and electoral divides across Ukraine in our national news as “the data visualization needed to understand the political situation in Ukraine” have, no doubt, distracted us from the situation on the ground and the geographic questions that underlie the political crisis. In fact, the country’s geopolitical situation may be far better mapped explain its emergence as a somewhat unlikely theater for playing out scenarios from an old Cold War, although for reasons more tied to natural resources: for the webs of pipelines, as much as the ethnic and linguistic divisions of the region, provide a the economic networks of the breakaway former Soviet. Although we’ve become accustomed to posit deep divides within our electoral politics and to grasp political divides by handy data visualizations, as if they both synthesized and decoded compelling sociological explanations, the data visualization seems to replace real reporting with stories of deeply set national fracture-lines, our love of infographics might become a form of disinformation that migrate from the television screen across the internet. For the infographics define and restrict the questions that might be asked about the situation, dangerously removing the issue of Ukraine’s sovereignty or politics from a globalized context of financial capital. 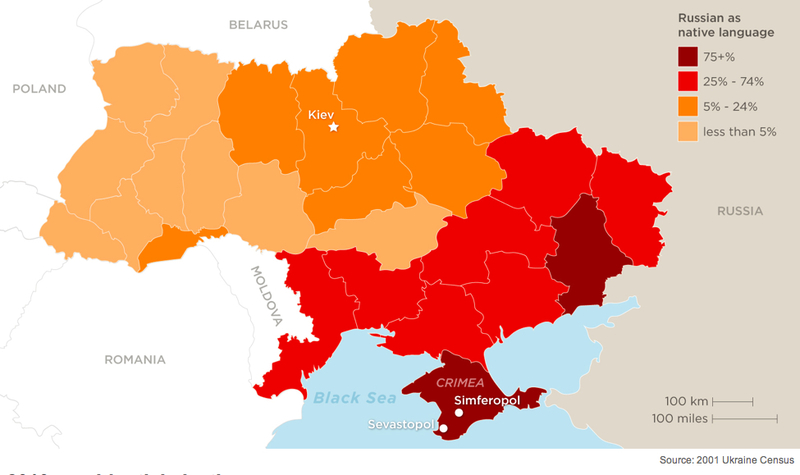 Infographics create particularly problematic in representing news about the Russian Federation’s recent annexation of Ukraine: they obscure the variety of more informative maps that have been drawn about the region, and the dilemmas of mapping the value of Ukraine as a region, or the specific value that its individual parts have gained. With the closure of many US news agencies abroad, and the shrinking of foreign bureaus, mapping Ukraine is an increasingly important means for grasping the political effects of shocks in a global inter-connected economy, where transactions are as important as the demographic composition of inhabitants, but the range of already generated and accessible data, readily processed into data visualizations, is in danger of drowning the real story of a narrative of global economics. For the projection of strategic value in Ukraine is replaced by images leaving viewers dumbfounded at the messiness of mapping electoral or demographic divisions or synthetic charts that compress a complex historical narrative that only make us wonder on what basis that country came to exist. The narrative needs to be recuperated in a broader map, perhaps one synthesizing less information on its surface. Perhaps even a clearer visualization of the place of Ukraine within the continuity of a spectrum of corruption and authoritarianism in post-Soviet republics can tell more of a story than one that carves up the country into distinct sectors. The so-called ‘civil war’ in Ukraine is clearly exacerbated by the increased eagerness of Russia’s interference with the nation’s sovereignty than divisions lying within its populace, in ways that the charting of the area as a longstanding “geopolitical prize” might reveal. We might need to look at the shifting ways that geopolitics have changed to make propitious the recent return from the dead of the Tsarist geographical construction of Novorossiya as a category that has suddenly acquired a rehabilitated geopolitical meaning in a globalized world: the surprising re-introduction of a construction of Tsarist geographers to refer to the Eastern Ukraine has the primary goal of rehabilitating a Ukraine primarily oriented to Russia–instead of its current government–that nicely lends itself to Putin’s pan-Russian (or anti-russophile) rhetoric. To understand what makes this particularly advantageous, we might begin from remapping Ukraine less in terms of ethnic divisions than pathways of transit of gas and other natural products; for these pathways might show what issues are at stake in Russia’s contesting boundaries of the region, and the reason’s for Putin’s odd re-use of a long dead name to hide his quite pragmatic interests in making it part of Russia once more. For the discovery of a range of gas fields in the country, and the inherited gas lines that run underground through Ukraine, have shifted the geopolitical meaning of the frontiers by which the country is mapped, as much as the mapping of its different ethnic inhabitants. 4. Ukraine’s contested sovereignty–or rights to sovereignty–can maybe be succinctly mapped by a variety of quite simple tension lines that exist in the region crisscrossed by a dense network of pipelines of natural gas. Indeed, the control over the pipelines speaks volumes about the mobilization of military forces along the borders of this relatively recent country than the ethnic divisions which can cause many Americans to raise their hands and shrug their shoulders as they try to grasp the volley of double-speak around the protection of Russian minorities. Andrew Barry has revealed the degree to which the pipelines of gas created a rapid shift in pricing the value of lands in the Caucasus in ways that are utterly incommensurable with the economies of its inhabitants; the value of the land for laying pipes and creating new sources of multinational investment have suddenly involved globalized economies in regions that were, until incredibly recently, rarely considered of value or easily on the map by international agencies, who are now increasingly involved in their use to a degree that local inhabitants have difficulty grasping. The new constellations of interests appear to be configured around the Ukraine in ways that questions of political annexation cannot come to terms with. The explosion of Ukraine as a sudden hotspot of the global map might be explained by maps of its status as a nexus of economic networks that many current infographics fail to register, since they are foreign to most of our cartographies of social or political division. 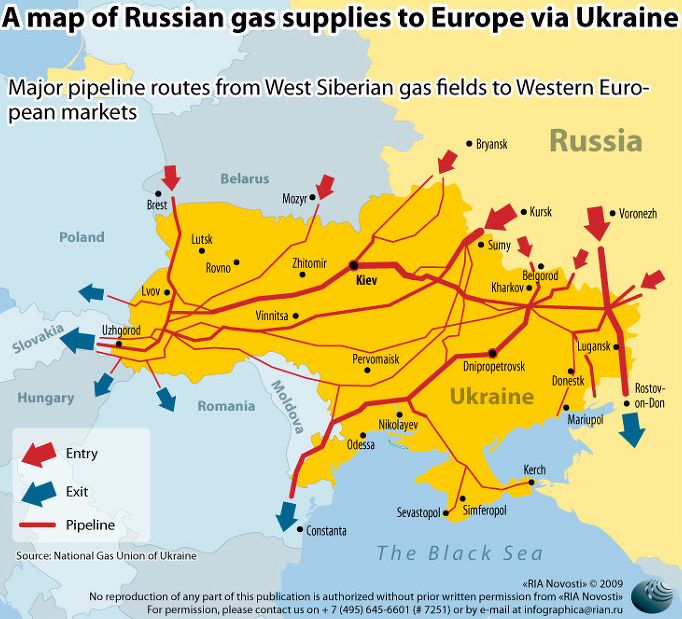 The concealed motivations for militarization in Ukraine seem to reflect the pipelines that are concealed underground or just above its surface–and the projected value that Gazprom identifies with their flow–in ways that have little to do with local sovereignty in ways that it is often considered, and are often removed from its inhabited lands. And it may well be that in mapping divisions in Ukraine as if condemned to irresolvable quagmires of disunion and political dissent, we obscure how its geopolitical situation reflects the rising stock of the region’s value for economic resources. Infographics that parse space by either ethnicity or electoral divides conceal and bury the geopolitical interest of Ukraine beneath data as if to mask the global strategies being played out on the ground. 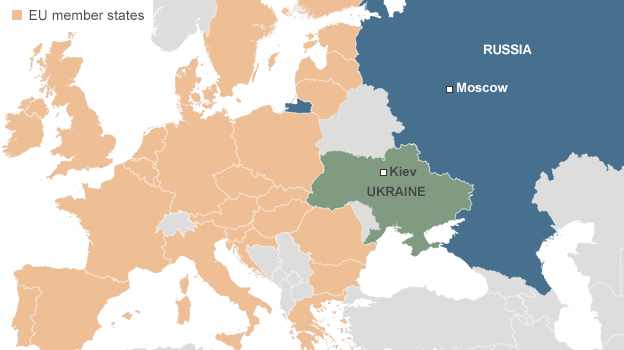 Have we fallen into a blind acceptance of the Ukraine as divided by diverse constituencies? Putin branded Ukraine’s government as a “junta” and announced cryptic “consequences” should the actual government–whose authority he denied– purportedly “threaten Russian lives“, the rhetoric of Russia jumped borders. What Putin duplicitously presented as a defense of human liberties or civil rights denied the sovereign bounds of a nation to defend ethnic Russians, playing a high stakes odd game with maps, in which the place of a mythical unity of “Russia” echoed the geographers of Peter the Great. For Putin has elegantly balanced his threats with the double-speak accusation that places direct responsibility at the United States–“for causing the demon of fascism to once raise its head in Europe, [while] Europe and the international community are for the most part silent and are instead engaged in a frenzied irrational campaign to demonize Russia”–barely concealing his own frustration that the world did not recognize by consensus the “treaty” or “Independence Bill” annexing Crimea unilaterally signed on March 18, 2014. The readily redrawn map must not be so readily given common currency. The motives for its radical redrawing cannot be so easily attributed a purported desire to protect human rights, since the redrawn boundaries to forge new networks that would meet economic aims and guarantee a monopoly on gas. Indeed, Russia’s open contesting of the sovereign independence of Ukraine is not so much about political sovereignty or the sorts of claims of economic dominance that are supported by shifting globalized economy, which cuts across boundary lines, and works with the facilitation of the extraction and flow of natural resources across land, and which dispenses with questions of political sovereignty. Putin’s openly Machiavellian rhetoric intentionally creates confusions between sovereign identity, national divides, and the strategic value of political control. The problem may lie in how Putin maps Ukraine, how many news maps map Ukraine in the US and world media, and the obstructions that both maps create in understanding what is at stake. We are, perhaps, in danger in assuming identities and divisions are synthesized and captured in maps, since they also easily package the rehabilitation of the rhetoric of the Cold War that Putin’s government seems to expect we’ll accept as credible. The new geography of Ukraine might, it is true, not be so readily understood, or its strategic importance incompletely grasped. As much as offer a port on the Black Sea, or a market for Russian gas, the status of Ukraine as a border into which the EU or NATO appears ready to poach invites this projected image of inevitable ethnic or linguistic divides in Ukraine that are ready lead to inevitable lines of national fracturing that would reflect its geographical position on the edge of Europe, defined by the Dnieper, Dniester and Bug rivers that run through it to the Black Sea. And yet–what do these visualizations even describe, save the inevitability of regional divisions? Is this all window-dressing of the deeper divisions of economic value and the inheritance of international investments in built pipeline that threaten to increasingly paralyze a Western response to Russian aggression, as much as motivate it? Is it possible that in those areas where the pro-European party won, and which directly abutted pro-Yanukovych regions, the amount of protests were fewer than in those which bordered on Russia? Can the election between Yanukovich and Tymoshenko be understood by analogy to the rifts and fault lines among political parties in our own country? How could they not be informed by the economic, as well as the ethnic, complexion of different regions of the country, and local pressures of self-definition of a region that had an unclear sense of identity before 1991? And aren’t these divisions now clearly based on economic interests, and the changing economic ties that have created a different calculus of value for folks in different regions of the country? Even as many pro-Russian nationalists exist in Ukraine who imagine a “Transcarpathian People’s Republic,” the geopolitics of the region have been eager to imagine the region’s incorporation into the Russian Federation for reasons far removed from ethnicity. In an era where “Ukraine” means many things, most reports have been oddly silent about the webs of international traffic that run across Ukraine, tying it to a larger picture of economic transactions that are as determinant of Russian attitudes to the region as the internal composition of the country. For s much as a nation of different areas of linguistic dominance, which evokes neo-Whorffian notions of linguistic-formation, the crucial fact of the presence both of gas fields in much of Ukraine that borders the East and Crimea key routes for the transit of Russian gas, and potential areas of future exploration, outweigh the geopolitical or ethnic considerations most often invoked in news media. (This surely seems more relevant to the current crisis than the survey of 300 years of Crimea’s history in a sequence of maps that chart its shifting boundaries and relative autonomy–despite the healthy volley of exchanges that post elicited.) 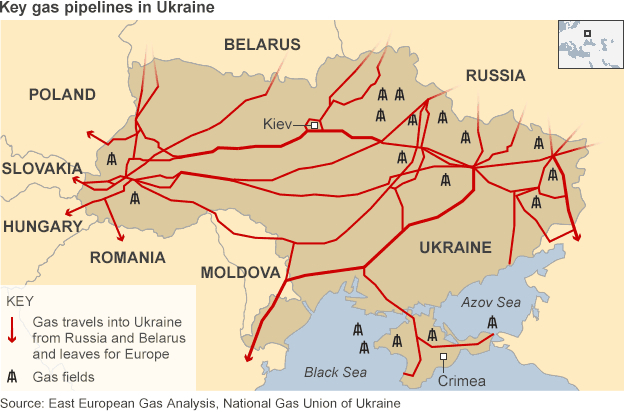 But the most recent contention of Ukraine’s sovereignty or boundaries seem driven by the shifting relation of a network of gas pipelines–and the traffic in gas–to the policing and control over its frontiers: the map of key pipelines that underlie the nation’s territory might be the clearest indication of the redrawing of this region as two geobodies, and the pronounced pressures placed on its continued cohesion. The recent mid-June decision of Russian CEO Alexei Miller to cut off gas shipments to Kiev and Ukraine–“Gazprom has decreased deliveries of gas to zero,” reads the public statement, seems the latest elevation of a declaration of real war, following months of negotiation, in which Russia seems confident that it can continue to funnel gas to the EU through Ukraine, the company which it mostly (50.1%) owned by the Russian government announced an act of economic aggression that seems to realize the true stakes over which the conflict had occurred. Although the territorial boundary line between Ukraine and Belarus, and Ukraine and the Russian Federation, does not seem to have been formally negotiated after 1991, the decision to cease gas imports to Ukraine challenge the region’s autonomy–and significance–as much as the surreptitious transport of tanks and military material across its recognize national borders: for cutting off gas supplies would achieve a similarly interventionist means to challenge the legitimacy of the government, just after the election of Prime Minister Arseniy Yatsenyuk in June 2014. With Gazprom insisting that Kiev has been pumping gas deliveries from Russia into underground storage tanks, without advancing adequate payments, Yatsenyuk observed that the decision “is not about gas,” but rather “a general plan for the destruction of Ukraine.” Ethnic rights of return seem less the point than controlling both oil reserves in the Black Sea and shipping lanes for valuable exports. If Ukraine has been long been said to have been loosing control over a tenuously drawn border with Russia, what is Ukraine save a territory needed to grow the Russian economy, and a region over which “threat[s] to the lives and health of the local population” are less relevant than restoring energy revenues? Perhaps the ethnic Russian groups encouraged the fostering of economic ties to specific regions. But for all of Putin’s rhetoric of cultural and linguistic nationalism–and the spectre of Russian persecution–the wells in the Crimea and Black Sea and in the shale sands of Eastern Ukraine have determined the value of the region’s annexation–and the rehabilitation “back from the Dead” of “Novorossiya” [New Russia], even if anti-Russian sentiment is strong in the “ethnically Ukrainian” western regions of the country, as if to prompt the increased federalization of the country. 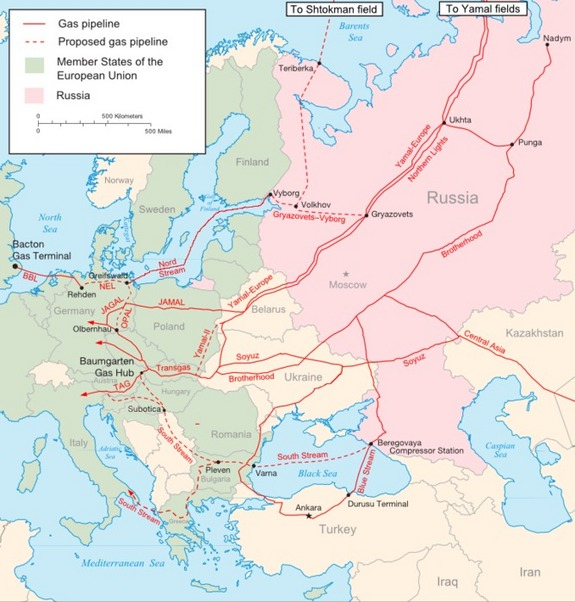 The constellation of pipelines situate Ukraine in a global energy market, revealing a web of ties linking Russia to Ukraine, and linking Russia to Europe through Ukraine–and indeed through several of the cities in the new entity, from Dnipropetrovsk and Lugansk, both of which lie on significant pipelines that route supplies from Siberian gas fields to the West–and the strength, as we have seen, that Russia could end Crimea’s gas supplies. 5. The futurology allegedly based on CIA information and geopolitical experts in the USA predicted both a division of Scotland from England, the separation of the Basque region, division of Italy and emergence of Wallonia and Lorraine, as if to deflate the image of NATO and comfort any fears of the coherence the EU might have ever possessed–at the same time as Germany incorporated Poland and emerged as the only power worthy of consideration in the region. The premise of Russian “rights” to these lands may mask a deeper sense of the continued economic coherence that they present to Putin’s revision of Russia’s economical relations to the perhaps-to-be-soon-disolved European Union. Charting routes of gas flows across the region and the central points of entrance and exit from the country, within the Crimea and in its eastern regions, suggests how intense the region has been for new investment of global capital in ways that make the Russian government particularly concerned: the economic consequences of pushing large quantities of gas to Eastern and Central Europe, potentially destined for expansion with the discovery of oilfields in the Black Sea and Sea of Azov, could both make Ukraine less dependent on imports of gas, boost Ukrainian exports of gas, or create a bonanza for Gazprom suppliers of the EU. (Since most of Russian gas going to Europe passes through Ukraine, the potential energy independence of Ukraine could pose a deep threat to the marketing of Russian gas, as the decision for such pipelines to be raised levies or used less widely, raising the spectre of a blow to Russian imports and balance of trade on the global energy market.) The increased involvement of European banks to the expansion of investments in pipelines across Ukraine has also inflected the ability to coordinate any national response–or the response of the European Union–to the very question of respecting national sovereignty, and made delicate questions of how Ukraine could be mapped: only the fear of Crimean nationalization of natural gas-fields in the Black Sea has led to potential ban on banks’ financial ties to Crimea, now a center of Russian finance. Lack of stability has been a source of banks’ continued concerns and increased financial concern of the energy industry. The planned Nord Stream and South Stream pipelines would allow Gazprom to avoid dependence on conduits in Ukrainian lands–and draw from the Shtokman and Yamal fields and Central Asia–is not yet on the horizon, and And so when Putin threatens that negotiations must begin with Russo-philic “real representatives” of the so-called Russian-speaking rebels of the Eastern Ukraine, who Putin has insisted should manage their own political affairs–and promote their “own” ties to Russia: by belittling the “utter nonsense” that Russian troops were in fact sent into eastern Ukraine, they are allowed to bemoan the “grave crime” of Ukrainian soldiers being sent to Eastern Ukraine. At the same time, the recent annexation of Crimea continues to play out quite uneasily on the ground and local politics. With looming bureaucratic disasters of the integration with Russian government growing increasingly troubling and apparent, even if “Crimea has always been an integral part of Russia in the hearts and minds of its people,” the annexation of Crimea within a month after the February 21 collapse of Yanukovich’s government on March 18 seem to have greater risks than alleged hopes to protect a population tied to Mother Russia and facing alleged persecution by a constellation of “russophobes” and “neo-Nazis.” The actual interests involved in this power game are so removed from those of local inhabitants or a hope for ethnic tranquillity, and seem more guided to restore harmony in a balance of the gas trade–or allow its manipulation and orchestration by Russian businesses. Indeed, the emergence of maps that projected the future remapping of the region helped to create its coherence. 6. The confirmation in the face of Russian denial that “separatists” who stoked unrest across Eastern Ukraine were Russian military and defense forces–based on systematic photographs of individuals and descriptions that the Obama administration confirms, indicating that subversive agents were placed into the country’s borders by the Russian military, drawing from a KGB playbook of fomenting local civil unrest in foreign states, at the same time as increasing military operations were staged near the Eastern border of Ukraine, in ways that seem to mirror the very points of entry into Ukraine of significant pipelines of natural gas. 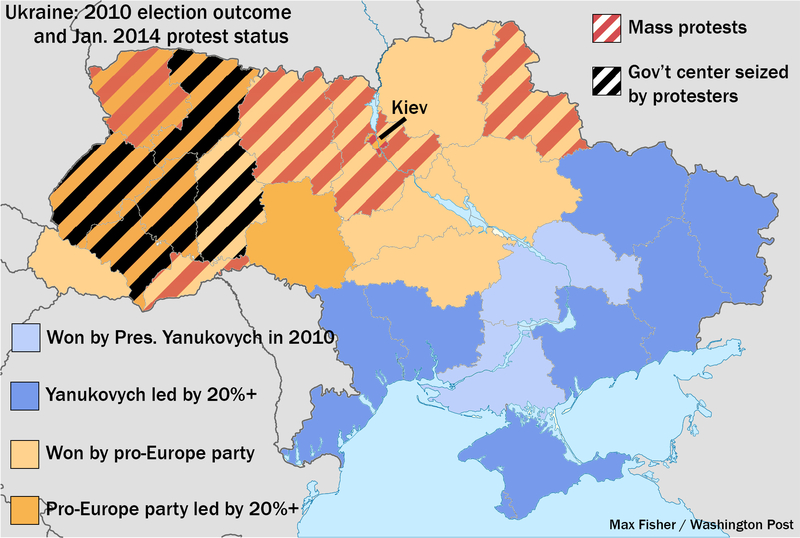 It may make sense to ask whether Max Fisher was duped by data of social divides–in suggesting that the above infographics of social divisions among groups favoring integration with the EU and those who seek, for ethnic or political reasons, to “draw the country closer to Russia,” reflect the dividing lines in recent electoral results–claimed to mirror linguistic divides between Russian and Ukrainian, but is actually less of a divide based on whether Ukraine will face Russia or Europe–and rather something like a ghost of Cold War rearing its head in Ukraine. The opportune clustering of Russian forces to the East–at the entrance of gas pipelines that enter Europe–almost seem to respond the Soviet-era placement of military arms in Ukraine to the far West, where tanks and mechanized infantry were intended to serve as an effective balance to NATO–with airforce and navy in and near the Crimea. 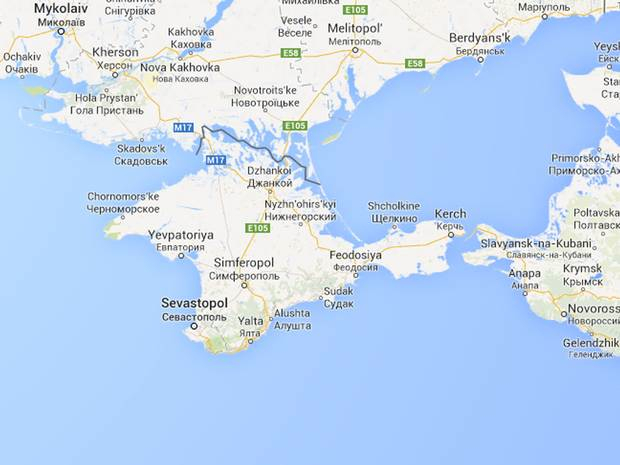 How is the right of Russia to “protect” Sevastapol and Crimea repeatedly evoked as a basis for a “just” war? 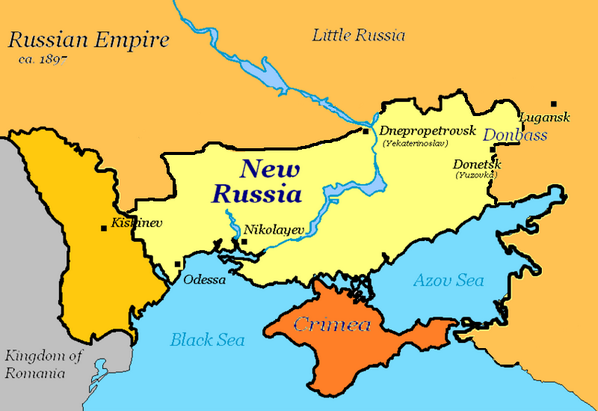 The odd evocation of all of Southeastern Ukraine by the old term of “New Russia” or “Novorossiya,” evoking an imperial term and eighteenth century legacy to designate the lands that the Empire conquered, north of the Black Sea, after which “God knows” why it rejoined Ukraine. 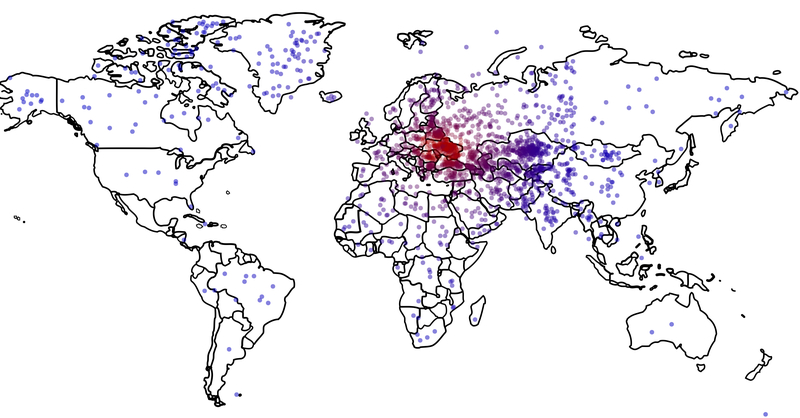 While the area was widely colonized by Russians, particularly in its urban centers, after being taken from the Ottomans, and nineteenth-century Novorossiya centered at Odessa, the sparsely populated region included a plurality of ethnic groups, and Russian became the language of its cities–with Yiddish–while Ukrainian dominated the countryside, but was resettled and developed after huge population losses by famine and in World War II by Soviets, leading to some unease that the former “New Russia” became part of the Ukraine in 1991. However, the adoption of the term by protesters in Donetsk who sought independence from Ukraine–and perhaps to rejoin Russia, and perhaps backed by Russia in a coordinated plan to federalize the region–was mirrored in Putin’s rehabilitation of this old toponymy, as if the reversion of lands away from Russia was a devolution of a former satellite of the late nineteenth century, was voiced on the region’s current website–and had circulated in the region ever since the region became part of Ukraine with the fall of the USSR. 7. Putin promoted an inflected Newspeak of the Cold War to argue that although Russia had the “right” to invade the province, Russia also “hoped” that such an unwanted act would be unnecessary–recasting regional boundaries that had existed from 1764 as a natural right to areas north of the Black Sea or Sea of Azov. By reclaiming sovereignty over an area of Tsarist heritage (rehabilitated as a Soviet) as a “natural right,” the invocation of “Novorossiya” re-brands a borderland in ways invoking how Catherine the Great invited Europeans to settle and over which Prince Grigori Potemkin presided, but largely to prevent it from sustained incursions of Cossacks and Tartars. But the rebirth of the geobody that Putin wants to redefine has, bizarrely, served as a sort of screen on which to project new identities in maps. For the densely inhabited regions between the Dniester and the Dnieper rivers were settled by towns, but surrounded by steppes, former swamps and peaty plains of Polesia, in a triangle of Brest, Mogilev on the Dnieper and Kiev, or the region of Lithuania, Wallachia, Bulgaria, Lithuania and Poland and Muscovy, whose heterogeneously inhabited cities and “deserted fields,” long part of the Ottoman Empire , where divided, and shown, quite disorientingly, as East of Asia, if the inhabitants of these once-swampy area also seemed to be poised between sparsely settled lands of Walachia an Muscovy, as if poised between East and West, and populated by amiable-looking traders of sorts: if the late seventeenth century sought to divide “Europe” from “Asia” along such rivers as the Volga, Don, Kama, and Ob, only by the eighteenth century did Philip Johan von Strahlenberg define the geographic divisions between Europe and Asia along the Ural Mountains, in a proposal Peter the Great’s program of Westernization adopted–and which Peter’s commander, the cartographer and future historian of Russia Vassily Nikitich Tatishchev claimed as his own, redefining Russia as European, and reclassifying Siberia as lying at an Asiatic remove. That is not that political divisions do not exist, but that the attentiveness to dividing the region into its constituent parts may go back to the positivistic origins of regional geography that hoped to grasp a coherent and legible picture of the region, rather than to capture the variety of forces that have now poised around its borders. Long hopes for creating a clear picture of the region is something of a geographic dream of clarifying the ethnic divisions of the region, if it is now presented not in the division between Christian and Islamic (Turkish) towns, and Cossack so much as political parties that seem all too rooted in ethnic divides. For a generation of Enlightenment geographers obsessed with delineating state frontiers and classifying continental divides, this area, not clearly on either side of the Ural Mountains, Ukraine posed problems of liminality, partly in Asia and partly in Europe, like Poland, and peopled by groups without frontiers, or whose relations were particularly hard to determine and would be even harder to determine during the ever-shifting regional geopolitics from Cossack resistance to Ottoman forces to the of Russo-Turkish wars over much of the late seventeenth and eighteenth century that would, in the end, grant Russia access to the Black Sea and a sense of entitlement to the region: the inhabitants of Ukrainian lands were situated in relation to other regions, rather than as a region, and Turkish and Christian cities on both sides of the Dnieper distinguished on the map–which noted continued incursions of Cossack and Tartar tribes. The unexpected recent rehabilitation of the mythic-historical construct “Novorossiya” as being not a myth, but rather defining “a country of twenty million people, with industry, with resources,” may in fact conceal that the resources are what military intervention would allow the Russian government access and the ability to control. The newly resurrected language of borders created an alternative nation-state. It has provided a basis to shift the denial Ukrainian autonomy into an actual excuse for military invasion: the assertion of the imaginary region of Novorossiya has effectively denied the boundaries renegotiated with the fall of the Soviet Union, as if they perpetuated a swindling that shortchanged Russian collective memory, and offered cover to deep-set fears the West would actually reclaim Ukraine; Putin has from April 17 re-described greater Crimea as if it were Russian, beyond having ethnic Russian residents. There is little coincidence that the wealth of Eastern Ukraine in its many coal fields and iron ore beside the Donetz River would itself make the region such a profitable site of resources. The region’s considerable wealth seems to have solidified the deep ties of the region to Soviet Russia, so that it is in practice impossible to extricate Russian desires for control over the region from trade in its natural resources or actual mineral wealth. So is his land grab a pragmatic one, or is Putin shadow-boxing both with Soviet collectivization and imagined NATO-expansion to Russia’s frontiers by resurrecting the historical confines of Novorossiya, over a century after its demise? 8. 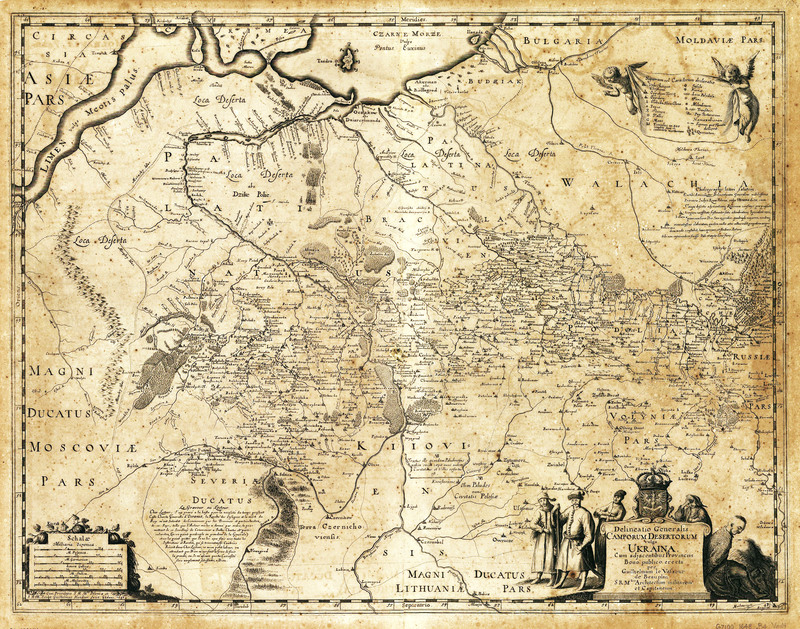 The reclaiming of this region that existed in a historical imaginary alone–but whose frontiers were far larger than the region where Yanukovych had won a large share of the popular vote–suggests the invocation of an imaginary heritage of a past frontier to disguise the protection of economic resources in an age of globalization. 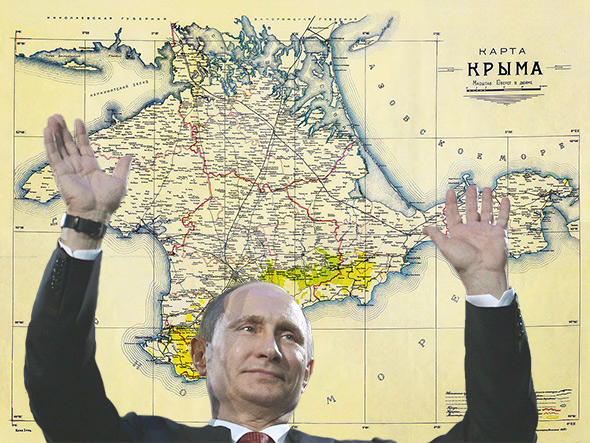 Indeed, Putin seems intent on enlarging the historical boundaries of Novorossiyain his current land grab. Putin was quite open about his true target of concern: “Needless to say, first and foremost we wanted to support the residents of Crimea. But we also followed certain logic: if we don’t do anything, Ukraine will be drawn into NATO sometime in the future. We’ll be told, ‘This doesn’t concern you’ and NATO ships will dock in Sevastopol, the city of Russia’s naval glory.” Mapmakers might do well to engage this redefining of the Ukraine’s sovereign bounds, and to consider the region less as a bounded territory in the manner it is so often mapped, but of crucial importance not only on account of the access that it offers to the Black Sea, but for the access that it allows to burgeoning gas fields in the Black Sea and the Sea of Azov, and to the network of pipelines Gazprom long ago laid across the region’s current actual boundaries. Is the actual vociferous denial of any contested territories in the map itself a Solomonic judgment, or a weirdly back-handed denial of the power of the imagined maps and boundary lines that seem so important to Putin’s own created image of himself as the protector and defender of Russophiles, and his manipulation of the situation to booster a flagging Russian nationalism? Or are we just punting, as the National Review‘s Alec Torres worried about National Geographic‘s decision to quickly recognize Russian annexation of the region, and Wikipedia’s hemming and hawing about how to acknowledge the disputed relationship between Crimea and Russia in its maps. Stephen Colbert present the map while he wondered about odd clusterings of imagined notional Ukraines in South Asia, Greenland or Canada, and one response near Iowa–as if the move suggested the belief of one polled respondent that in invading Ukraine, Putin might be entering himself in the next Iowa straw poll. Doubtlessly, the notion that Russia might be fighting a war far from its borders is somehow a part of the odd mental baggage most Americans have about being stationed in Iraq or Afghanistan–an uneasiness informing the recent toponymic mutation of “Chiraq” to describe the surge of violence in the city in the Midwest. But the point is that unless we return Ukraine to a sense of geographic place, our understanding of the situation that has led to the crisis. 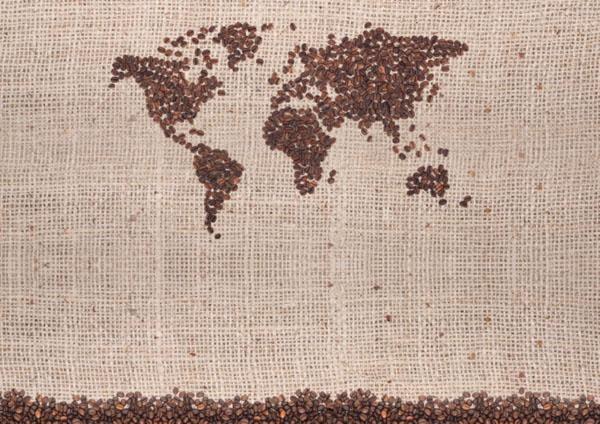 Where is Ukraine, anyway? Definitely on a map, and in many heads, but you might do well to take care to map the dynamic to understand how its frontiers are in danger of being redrawn.